Weddinghousehold.com - In many Muslim weddings and Islamic wedding culture , it is a tradition held for most Muslim brides in the Middle East and South Asia. 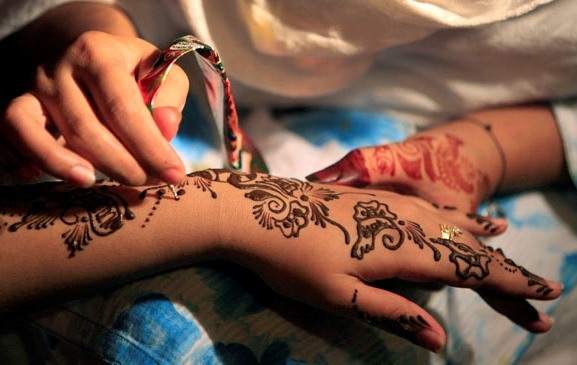 Muslim henna party usually takes place one to two weeks before the wedding night. Henna is meant to not only adorn the bride, but also to protect her as well. As we know, henna has some benefits include its ability to protect the skin, detoxify the body, improve nails, and relieve headaches. During a henna party, the bride traditionally wears a formal yellow outfit and make up artists uses a paste made from dried henna leaves to paint intricate patterns on her hands and sometimes her feet. The pigment of henna is quite dark and stains the skin very easily, leaving little room for error or mistakes as it cannot be washed off quickly. It's definitely the favorite part of the prewedding Muslim ritual and on having a lot of fun. The henna begins as a paste which is applied by the artist using a paper cone with a fine tip at the end. When henna is applied to the skin, it is imperative for the person who is getting painted to remain very still during the application process because the intricate patterns of the designs and the unforgiving nature of the henna paste. As the paste dries, it becomes hard and flakes off, which leaves the skin beneath it stained with the intricate designs the artist created. The longer the paste stays on the skin, from orange to dark maroon that fades within 1 to 2 weeks. Don't afraid, henna will create beautiful and sensual body art. The next wedding ceremony is Baraat. Baraat is customary in North Indian and Pakistani. In joint muslim henna wedding ceremonies the groom arrives at the ceremony after the bride with his entourage of guests. The bride goes to on the stage under a yellow color dupata, or large scarf, held up by six female relatives or friends. Her head is covered and bowed, and she doesn't have much makeup or jewelry on at this event. The baraat typically plays loud songs while entering the ceremony hall and is greeted by two parallel lines of the bride's family and friends. 0 Response to "Prewedding Rituals: Muslim Wedding Henna Party"